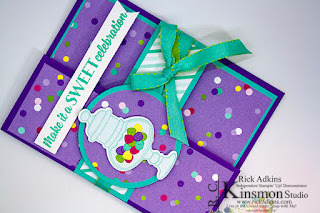 Hello and welcome to my blog; today I am going to share with you a fun little card using the Sweetest Thing Bundle and products from that suite. 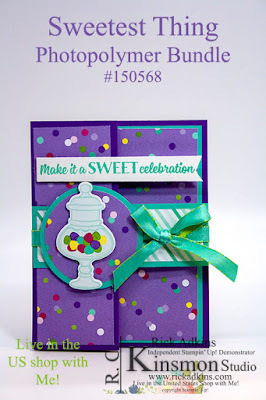 This was one of my favorite suites in the 2019 Stampin' Up! Occasions Catalog or as some like to call it the Spring/Summer Catalog. I loved this set as soon as I show it back in November as I attended OnStage. I loved it 's bright colors, and cheerful demeanor. Not, to even mention how happy it makes me just by looking at it. Here's a look at my card. I designed this card to look like just a standard card but with a interactive element. I used the How Sweet It Is Cardstock Pack plus a little whisper white cardstock to create my card. There really isn't a lot of stamping with this card. The actual star of this card is the How Sweet It Is Designer Series Paper. I used a lot of the designer series paper to create it. 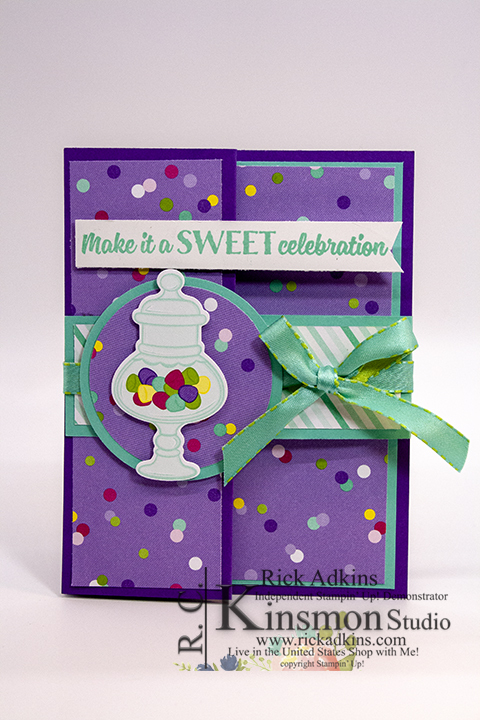 Event the candy jar on the front came from the designer series paper. This is actually a easy card to create it needs a good burnishing to make it lay flat; so you don't see the fold. Sometimes when you create a z-fold card the card will stick up slightly, but by burnishing the fold really well it will lay properly. 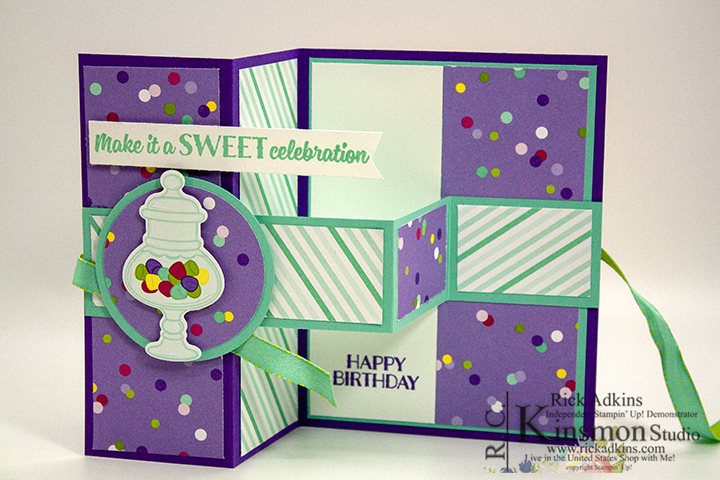 I used the Jar of Sweets Framelits to cut out one of the Jars from the designer series paper. Not only do they cut out the images from the matching stamp set but select images from the designer series paper as well. So that's a big plus when you really thing about it. Less fussy cutting can be a good thing. 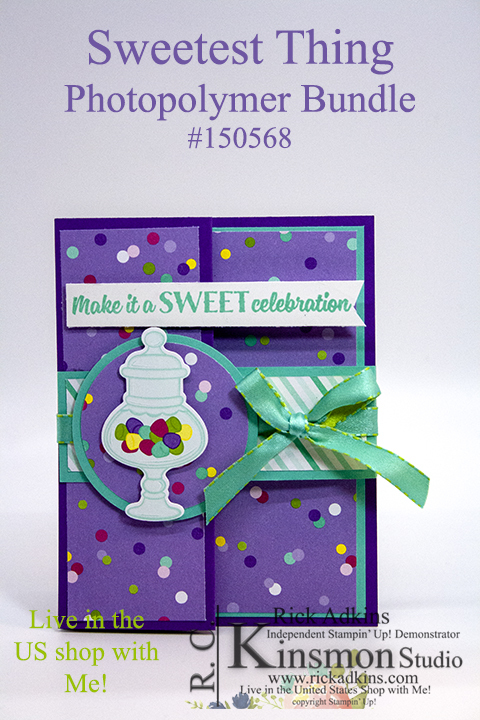 I used the layering circles to cut the two circles for the front of the card. I used the 2 1/2" circle framelit to cut the Coastal Cabana circle, but used a 2 1/4" circle punch for the designer series paper circle. You could use a 2 1/2" circle punch if you have one. The Coastal Cabana/Granny Apple Green Reversible Ribbon helps to hold the card together. It's secured on the back with a mini glue dot. 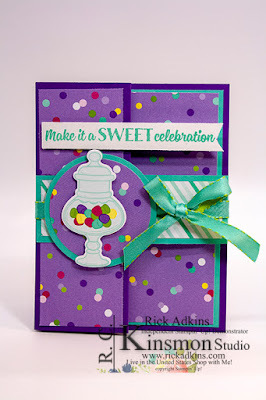 Once you undo the ribbon your card will open to reveal this fun inside. To add my sentiment I stamped on a piece of 1/2 whisper white cardstock using Coastal Cabana Cardstock. At the end I used my Paper Snips and created a fish tail banner. Thanks for dropping by today, I hope that you have a wonderful start to your week. If you would like any of the supplies that you have seen today you can order them in my online store 24/7.